There are numerous obvious reasons why aquariums and zoos are so popular. We humans are curious by nature and have an inherent desire to explore the unknown and discover environments foreign to our own. In the case of aquariums, many people have never had an opportunity to dive beneath the waves; an aquarium affords them an intimate experience with life forms of the underwater world. If you want to find nearby zoos and aquariums with an ease, then you’ve came to the right place. We present to you Zoo Finder, an amazing app that can help you find the nearest zoo/aquarium, whether you’re in your country or in a country that you’ve traveled to. Created for both Android and iOS users, light and very simple to navigate, this app will certainly make your family adventures a lot easier! 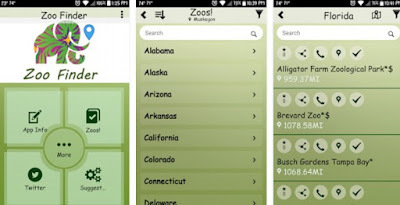 Zoo Finder is feature-rich and well-packed travel app. With it, you can search for local zoos and aquariums by state, find accredited zoos for the state you choose, receive useful zoo information (name, location, website, map, phone number), and so much more! For instance, you can share your experience by leaving comments and rate the zoos you’ve visited. You can bookmark zoos you’d like to visit later, check in at zoos while you are there, and share whatever you like via any social site you’re using. If you like the sound of it, Zoo Finder can be downloaded from the App Store and from Google Play as well. Get it today and enjoy your little adventures!